Almighty God, through thy servant Anselm thou didst help thy church to understand its faith in thine eternal Being, perfect justice, and saving mercy: Provide thy church in all ages with devout and learned scholars and teachers, that we may be able to give a reason for the hope that is in us; through Jesus Christ our Lord, who liveth and reigneth with thee and the Holy Ghost, one God, for ever and ever. Amen. Almighty God, through your servant Anselm you helped your church to understand its faith in your eternal Being, perfect justice, and saving mercy: Provide your church in all ages with devout and learned scholars and teachers, that we may be able to give a reason for the hope that is in us; through Jesus Christ our Lord, who lives and reigns with you and the Holy Spirit, one God, for ever and ever. Amen. Anselm is the most important Christian theologian in the West between Augustine and Thomas Aquinas. His two great accomplishments are his Proslogium (in which he undertakes to show that Reason requires that men should believe in God), and his Cur Deus Homo? (in which he undertakes to show that Divine Love responding to human rebelliousness requires that God should become a man). He was born in Italy about 1033, and in 1060 he entered the monastery of Bec in Normandy to study under Stephen Lanfranc, whom he succeeded in office, first as prior of Bec, and later as Archbishop of Canterbury. In 1078 he was elected abbot of Bec. The previous year, he completed a work called the Monologium, in which he argues for the existence of God from the existence of degrees of perfection (Aquinas's Fourth Way is a variation of this argument). In 1087, while still at Bec, he produced his Proslogium, an outline of his "ontological argument" for the existence of God. Taking as his text the opening of Psalm 14 ("The fool hath said in his heart: There is no God. "), Anselm undertakes to show that the fool is contradicting himself -- that the concept of God is unique in that anyone who understands what is meant by the question, "Does God exist?" will see that the answer must be "Yes." The argument has received mixed reviews from the start. Almost at once another theologian, Gaunilon, wrote, "A Reply on Behalf of the Fool." Thomas Aquinas rejected Anselm's argument as inconclusive (and is followed in this by most Roman Catholic writers today). Kant practically made his reputation as a philosopher by explaining in detail what he thought was wrong with Anselm's argument. On the other hand, Leibniz and others have thought it valid. King William II of England had no fondness for the Church, and at the death of Lanfranc he kept the See of Canterbury vacant until he was gravely ill, whereon he promised to let Anselm be made Archbishop. Anselm was made Archbishop (4 December 1093), the King recovered, and the two began to dispute the extent of the King's right to intervene in Church matters. 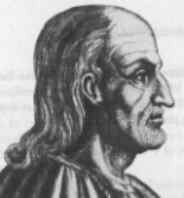 Anselm went into exile in 1097 and remained in Italy for three years until the King died in 1100. During that time Anselm was instrumental in settling the doubts of the Greek bishops of southern Italy about the doctrine of the Filioque. For a discussion of the Filioque (the principal doctrinal difference between Eastern and Western Christians), see article in the Christia library. He also devoted the time to writing a book known as Cur Deus Homo? (meaning Why did God become Man?). In it he puts forward the "satisfaction theory" of the Atonement. Man's offence of rebellion against God is one that demands a payment or satisfaction. Fallen man is incapable of making adequate satisfaction, and so God took human nature upon Him, in order that a perfect man might make perfect satisfaction and so restore the human race. The success of his work may be gauged by the fact that many Christians today not only accept his way of explaining the Atonement, but are simply unaware that there is any other way. For a discussion of Anselm's theory of the Atonement and a comparison with Abelard's theory, consult the Web page mentioned above. For several other theories of the Atonement, read the Essays GEN05 RUFF, GEN06 RUFF, and GEN07 RUFF, found at the same location. The five works Proslogium, Monologium, Gaunilon's Reply, Anselm on Gaunilon, and Cur Deus Homo? are available in a single paperback volume from Oxford Univ. Press. After the death of King William II in 1100, Anselm returned to England at the invitation of the new king Henry I, only to quarrel with Henry about the lawful extent of the king's control over the selection of bishops and abbots (it must be remembered that these officials had civil as well as religious authority). Anselm was again in exile from 1103 to 1106. In 1107 a compromise was reached, and Anselm returned home to Canterbury, where he lived his last few years in peace, dying 21 April 1109. Typical of Anselm is his reversal of a tendency among English bishops after the Norman Conquest to ignore or downgrade the Anglo-Saxon saints as representatives of the conquered race. Lanfranc had proposed to remove even Dunstan and Alphege from the calendar, the latter on the grounds that he had not died as a martyr for refusing to deny the Christian faith. Anselm argued that, if he was not a martyr to faith, he was a martyr to justice and to charity. I have written the little work that follows... in the role of one who strives to raise his mind to the contemplation of God and one who seeks to understand what he believes. that I may rejoice in you. tenderly you draw us from hatred and judgement. and with pure milk you feed us. by your anguish and labour we come forth in joy. through your gentleness we find comfort in fear. your touch makes sinners righteous. in your love and tenderness remake us. for the beauty of heaven may your love prepare us.